In another time and another life, autumn became more than it had ever been to me. It became a magical time which meant shorter days, longer nights, chilly ears and, often, a sojourn to another country where there Americanisation of Halloween lent its magic to a (mostly) peaceful landscape where I could rest, read and recharge for a few days surrounded by a family that, though not mine, had nonetheless warmly welcomed me. 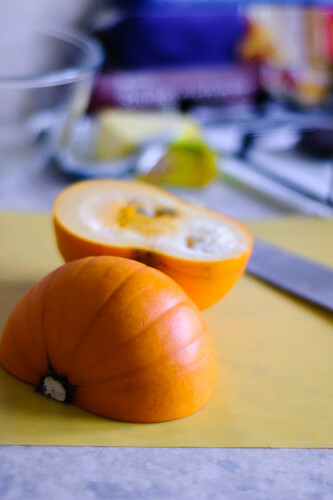 I wrote that a year ago, almost to the day, in a post on the (somewhat mothballed) previous version of this blog, entitled "Reclaiming Autumn", where I talked about how I came to love, lose and reclaim Pumpkin Soup as my talisman of Autumn. 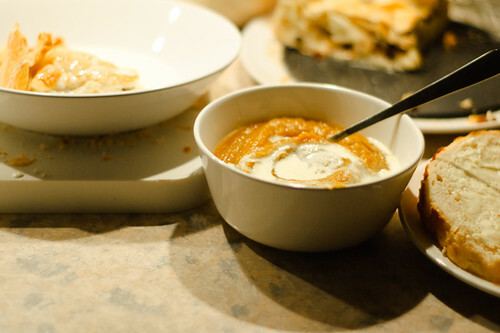 I'd forgotten the exact date I wrote that, until I went to look for that post when writing this one, and had a bit of a laugh to myself, because it was exactly a year and one day later that I made Pumpkin Soup again. This year's audience was mostly the same as last years (minus a brother-in-law to be) but the soup was extra special, because among it, was the pride of my foray into growing my own veg - a home grown pumpkin. Of all the veg I grew this year, the pumpkin was special. Yes, fresh salad is nice, home grown strawberries are lovely and eating baby sweetcorn right from the plant is fun, I'd have forgone them all for my pumpkin. It's been sitting in the kitchen for a few weeks now, ripening nicely among its larger, shop-bought cousins (a pumpkin a day makes Ann a ridiculously happy girl, especially given their short period of availability) and part of me wanted to keep it, I'd spent so long growing this thing that I had to know if it was actually a real pumpkin inside, so with a wee bit of a lump in my throat, I cut it up, ready to roast, and thence, to become soup. When I wrote about pumpkin soup last year, a few people asked for a recipe, and at the time I couldn't provide one, because I hadn't written down what I'd done, so this year, I paid attention. I should point out that this is by no means a tested or scientific recipe. I don't tend to do weights and measures, so your mileage may very well vary. Cut each pumpkin in quarters, and scoop out the gunk in the middle. 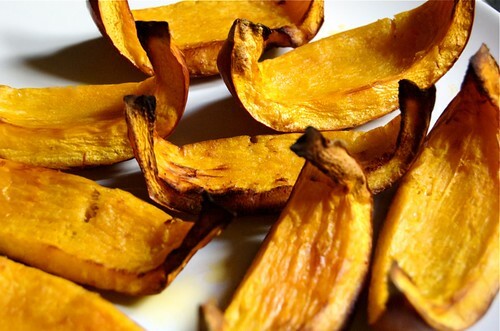 Then cut each quarter in half again, so you have eight pumpkin wedges per pumpkin. 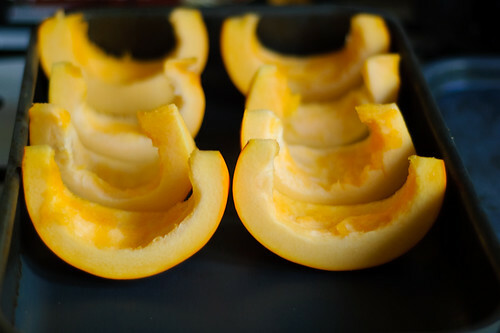 Lay these out on a baking tray or roasting dish, and scatter about a bulb's worth of garlic cloves around the pumpkin. Drizzle some olive oil over the tip, scatter some salt, and put in an oven that's been pre-heated to 200°C for about 30 minutes, or until nicely roasted. Finely chop the shallots, and gently fry them with a wee bit of butter and olive oil in the bottom of whatever pot you intend to make your soup in. Peel the skin off the pumpkin (it should come off reasonably well with the aid of a reasonably sharp knife) and put the mushy pumpkin bits in the pot with the shallots. Then grab the roasted garlic cloves and squeeze their innards into the put too. Throw in some herbs de provence (or mixed herbs), cumin and cinnamon and mush the whole lot up, before adding enough stock to cover the mush, plus about half an inch of water above (sorry, I know that's not a very exact description). Let this simmer for a while until it goes even more mushy, and then taste. Season with salt and pepper (and more cumin or herbs) if you feel it needs it. Otherwise, get your hand blender out and try not to cover the kitchen in soup while you get carried away with the joy of blending. Serve with a dribble of cream and a grind of black pepper, and enjoy. This makes enough for four people, with enough left over for a large bowl later, when lunch or dinner is a distant memory and handknit slippers and crocheted lap blankets (or your equivalents) aren't quite enough to keep you warm.